We swiped down on our phones to refresh Google weather at least twice every day. Utah weather can be so unpredictable. The weather was predicting a large snow storm for just over a week prior to this Utah family Christmas photoshoot. As we got closer to the date of the shoot, the weather became so much more ideal. So ideal in fact that it was as perfect as it could be. We were blessed with a blanket of fresh powder and as soon as we arrived at Oak Hills Reception and Event Center and we knew we couldn’t have asked for better! Oak Hills Reception and Event Center is a Utah wedding venue that is under new ownership in Layton, Utah. Along with being an amazing venue to get married at, it also has the most perfect line of Christmas trees that during our session were dusted with snow and icicles. As the Moyes family hung over-sized ornaments on those trees together, we saw them transform from ordinary pines to full fledged Christmas trees! We love any time that we get to hang out and do a session with the Moyes family. 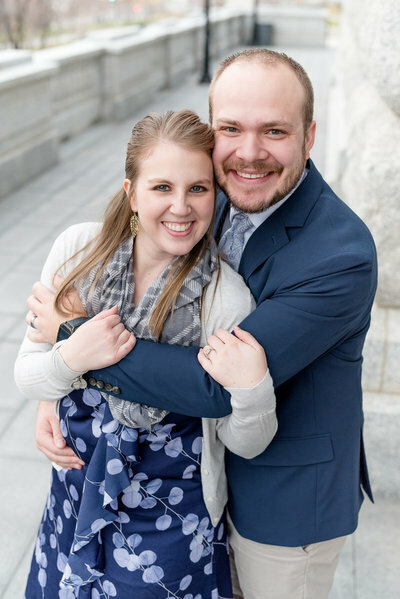 We were lucky enough to meet them a year ago just before they got married to do a Salt Lake family and engagement session. (Click here to see that blog post!) They are some of the kindest people that we have ever met, and they are a total blast to shoot with! If you need any proof of that, just see all the adorable props that they brought to their shoot! The Rudolph noses, reindeer antlers, and hot chocolate mugs were the perfect addition to make their session special. Even though the weather was cold, we all warmed up quickly from all the laughs and fun we had! We can’t wait to see the Christmas cards that the Moyes family sends out this year, and we are so glad we won’t be the ones having to pick which pictures to use on them! Picking favorites was nearly impossible for us, because we love them all! Ashley, Ryan, and girls! Thank you for letting us do this Utah family Christmas photoshoot with all of you! We had so much fun! Have a Merry Christmas!